SPE offers the lowest cost for reaching key buyers and decision makers internationally. The Journal of Petroleum Technology (JPT) presents authoritative briefs and features on E&P technology advancements, oil and gas industry issues, and news about SPE and its members. JPT has the world's largest print circulation among upstream publications—by as much as two to three times! Advertise in JPT with print and online options. SPE offers a range of ways for you to reach your target audience. We have more than 91,000 professional members in 143 countries. But that's not where your exposure ends—SPE publications, websites, and eNewsletters reach thousands of upstream professionals who aren't SPE members. Explore digital opportunities for communicating your message. 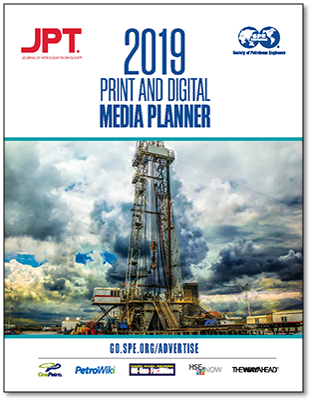 Download the 2019 Media Planner below. Hear what some of our advertisers have to say about why they advertise with JPT — the largest circulation print publication in the upstream oil and gas industry. Vic Coleman, Technical Services Manager, Key Energy Services, talks about the importance of JPT.